This is it! My final Beauty BigBang review for the month. Today we’re looking at BBB-001, a circle plate with four full-nail images and four smaller images. 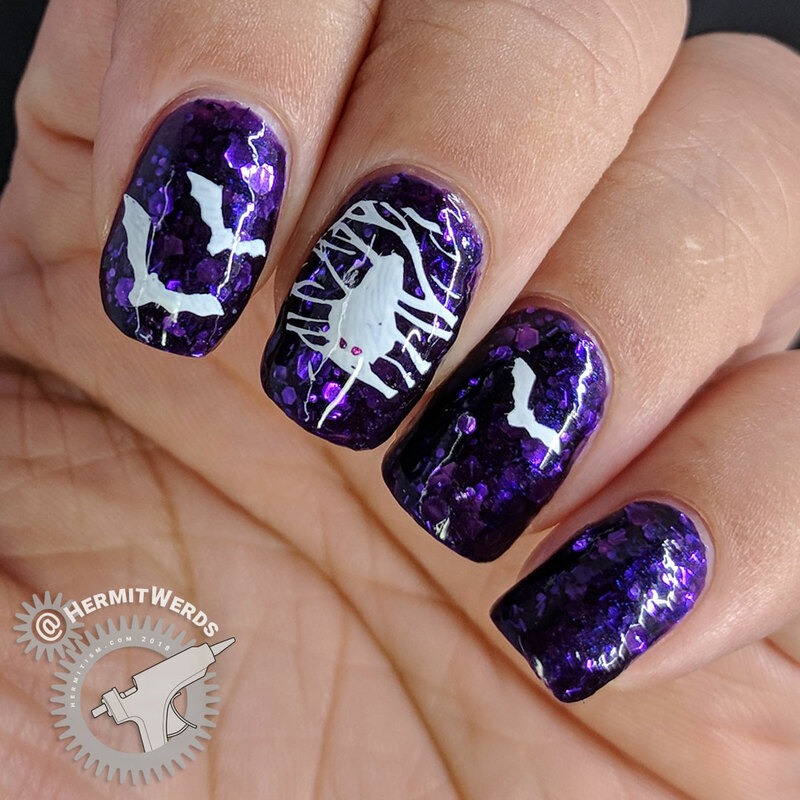 They’re all quite fun, but since I was going to create a full look with them, I decided to stick to the bats since I could steal a few out of the Halloween grab bag full-nail pattern. At a 5.6*5.6cm size, this plate just has fewer images, so it’s harder for it to stand on its own. It has one image that’s an outline. The rest are all silhouettes with a few spots where an extra color can be added or not. Because of this, I think the other images can be used with each other fairly easily while the hand and eyeball will stand alone. 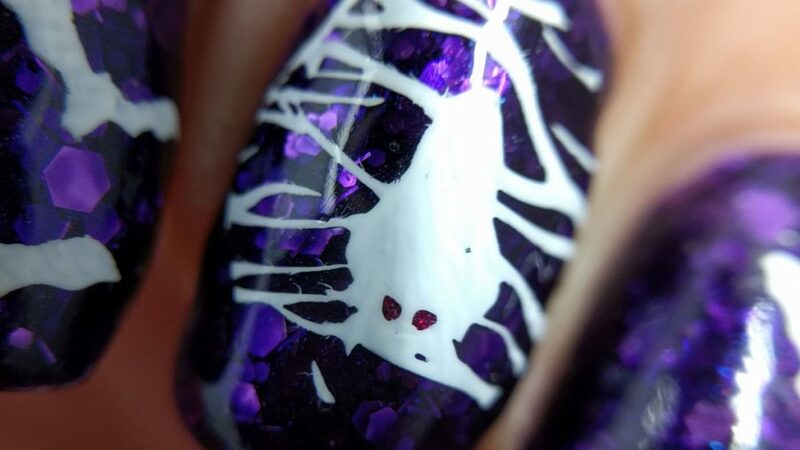 I also really love the spider full-nail image. I looked through what I had and realized all of the spider-heavy full-nail images I had were also web heavy. This has a touch of web, but is mostly spider and I’m loving it. The density of lines creates a neat kind of chaos, but also opens me up to wanting another full-nail spider image with more separated spiders (BBB-02 has a nice scatter in size, etc, but I didn’t get it) . LOL I do wish a larger version of the spiders had been added instead of the hand/eye simply for matching purposes. I’ve noticed UberChic does this a lot with her plate sets and it really helps when creating accent nails or being a skittle-lover like me. 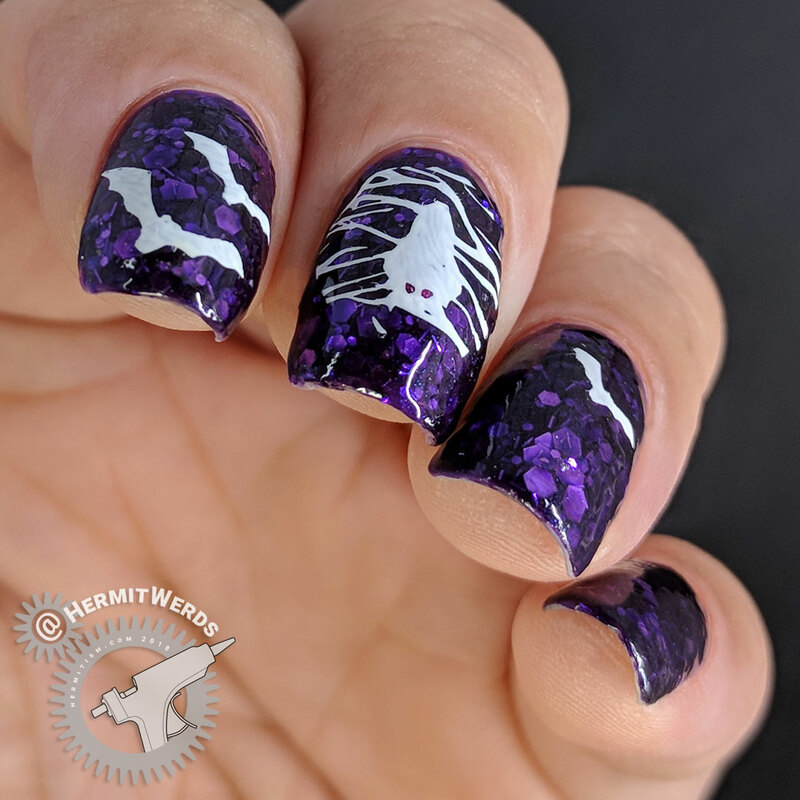 The Halloween grab bag full-nail pattern was ripe for my favorite kind of abuse so naturally I stole bats out of it. And that leaves the bats in a tree image. Honestly, I liked this image better before I #NailFail-ed with it. /sigh Beauty BigBang also used these bats in the tree on their XL-028 stamping plate. When reviewing a stamping plate, I only use the images on the stamping plate I’m reviewing or I would have used the two plates together for this one. One bad thing about the full-nail images (except for the ghost) is that they are all very dense. So if you were hoping to show off the polish underneath more, you’d have to dig into your bag of tricks to make it work. My bag now includes framing with a template, but I also like to pick out little parts of the design and use it as tiny accents on the other nails. That way you get your full design and you get to show of the polish. I also gradient stamp with a clear polish to fade out my stamping into the base polish. All good tricks. 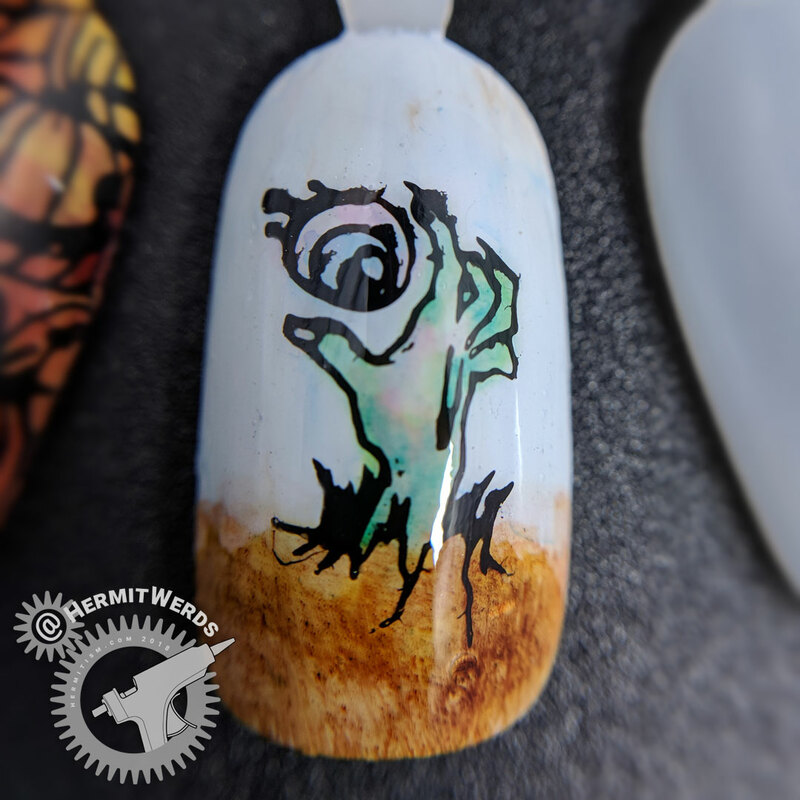 But for now it’s a zombie hand. Eye Polisher. Background is frankensteined grey french tip. Stamping done with Mundo de Unas’ “Black” and filled in with sharpie marker ink diluted with rubbing alcohol. 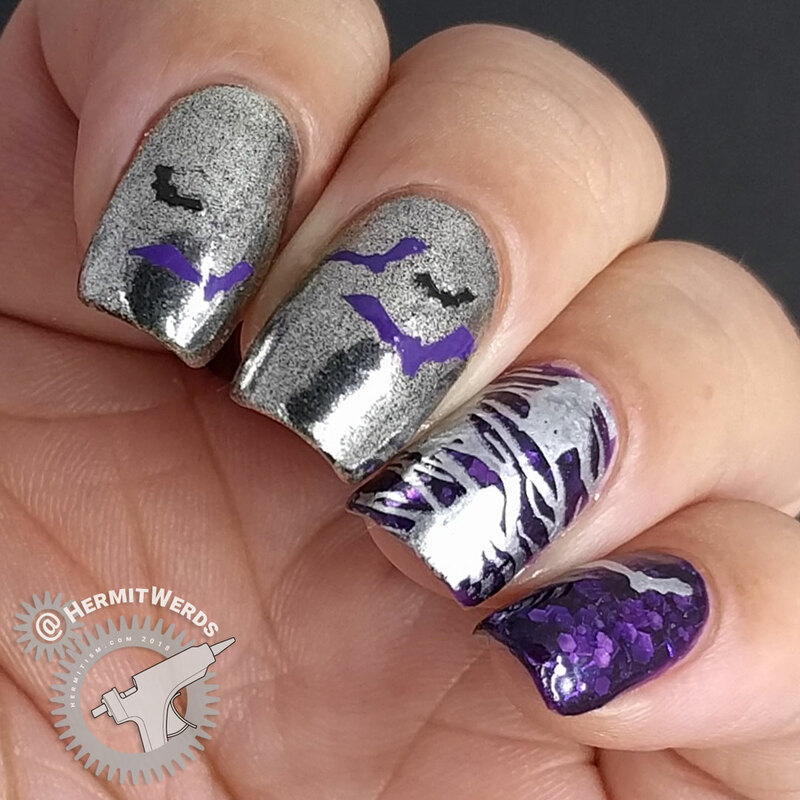 Edit: This nail art also covers #glamnailschallenge’s Spooky Skies prompt. This is why a shrink stamper is so great. I took the smallest bat in the full-nail image and made it smaller so I could have three sizes on my nails. I also used a circle template to focus on one bat among the branches. I think it wouldn’t have been necessary with a light background and dark stamping, but with that reversed the focus really helped. The eyes on the bat are so small though! I filled it in with pink, but can you even really see it? I’m happy that I was able to add this stamping plate to my collection. It has an interesting variety that will let you create very image dense or very simple nail art depending on how you use it. And while flying bat images are a dime a dozen (which only makes it more disappointing that they used the same one and just played with size on both full-nail images), a bat hanging upside down in a tree is a rare and precious thing. 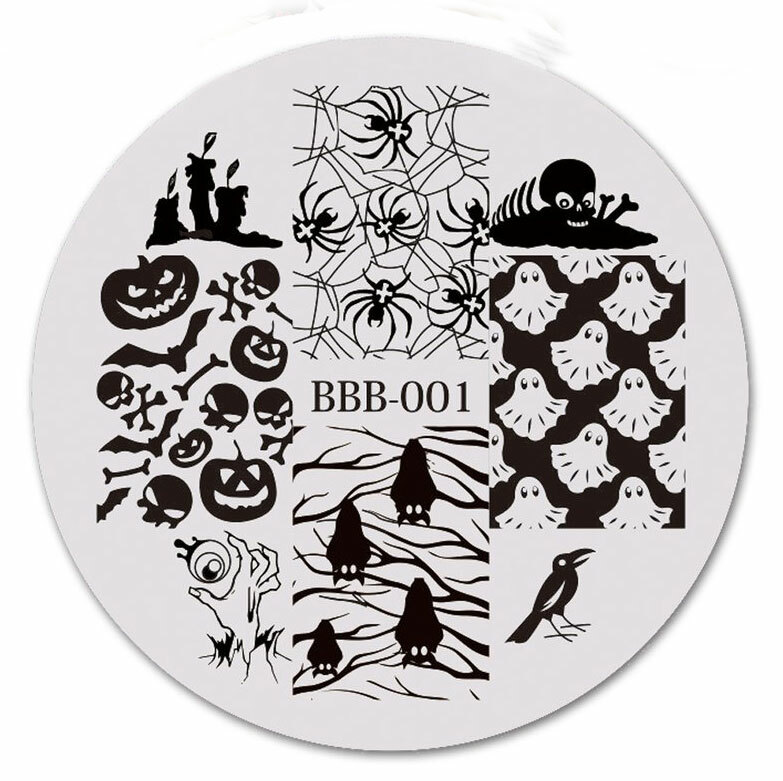 You can purchase just this stamping plate (BBB-001) or get it in the circle plate set at Beauty BigBang. Use my discount code (hermi) for 10% off your order. (Non-affiliate code). Thanks again for sending these to me, Maggie! When I ended up not being able to re-use my glow in the dark background for this nail art, I had to adjust my design quite a bit. And I thought: why not use this Born Pretty chrome powder to contrast with the purple glitter-filled jelly? I’ve been meaning to use it. Yeah…I’m not impressed at all. And maybe it’s my fault for using black as the base polish, but the powder is not finely milled enough to look even somewhat smooth. It also ended up being not finely milled enough to stamp with. So then I tried bringing in my usual silver polish for stamping and the contrast between the two silvers was…not good. I plan on running a few tests with it on not my nails and if it doesn’t work out, then it’s getting chucked in the misc craft bin. Little bat sequins fished out of Sinful Colors’ “Got a Bat Attitude” (a terrible glow in the dark polish with cute bats).